Herpes virus infections are often observed prior to the onset of antibody-mediated autoimmunity among patient with hypomorphic mutations in recombination-activating genes 1 and 2 RAG1/2), especially those with late-onset combined immunodeficiency. The aims of our studies were to examine if viral infections can trigger autoreactivity in models with hypomorphic mutations in their recombination activating genes 1 and 2 (RAG1/2). and autoantibody generation, anti-viral antibody and cellular response for weeks after infection. 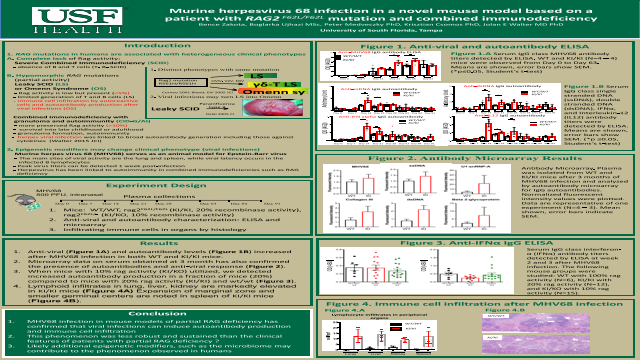 production to virus and self antigens after MHV68 infection. However, mice with hypomorphic rag mutation developed increased and sustained autoantibody levels compared to wild type mice. MHV-68 infection in hypomophic rag2 mouse models induce increased antibody production to irus and self, suggesting polyclonal activation of autoreactive B cells and break in B cell tolerance. These findings allow mechanistic insight to the development of autoimmunity in the setting of viral infections among patients with primary immunodeficiencies. Summary: Herpes virus infections have been observed prior to onset of autoimmunity in patients with only partial activity of recombination-activating genes 1 and 2 (RAG 1/2). In this study, we examined the effects of murine gammaherpesvirus-68 on the immune system of novel RAG 1/2 deficient mice designed to model human patients with partial RAG 1/2 activity.References: Corneo B, Moshous D, Güngör T, Wulffraat N, Philippet P, Le Deist FL, et al. Identical mutations in RAG1 or RAG2 genes leading to defective V(D)J recombinase activity can cause either T-B-severe combined immune deficiency or Omenn syndrome. Blood. (2001) 97(9): 2772–6. Ehl S, Schwarz K, Enders A, Duffner U, Pannicke U, Kuhr J, et al A variant of SCID with specific immune responses and predominance of gamma delta T cells. J Clin Invest. (2005) 115:3140–8. Dalal I, Tabori U, Bielorai B, Golan H, Rosenthal E, Amariglio N, et al. Evolution of a T-B- SCID into an Omenn syndrome phenotype following parainfluenza 3 virus infection. Clin. Immunol. (2005) 115:70-73.